The 2019 season officially opens on Saturday, May 11th. The day will start with bowling at 12:30, followed by the Annual Spring Meeting at 2:00 pm. A calendar of events for the year is available for download as a PDF document that you can download and print if desired. The 2018 season is scheduled to open on Monday May 14th. This year the club will commence with an opening ceremony to thank the CHEST Legacy Fund for their generous grant in 2017 which allowed us to replace the greens boards, modify our irrigation system and purchase a defibrillator. The ceremony will commence at 1:00pm with a ribbon cutting and reception followed by club bowling at 1:30. The club will host our annual Open House and Barbecue on Saturday June 2nd, which is also National Bowls Day across Canada. Please take this opportunity to promote this free event with your family, friends and acquaintances and encourage them to come out and give our sport and club a try. 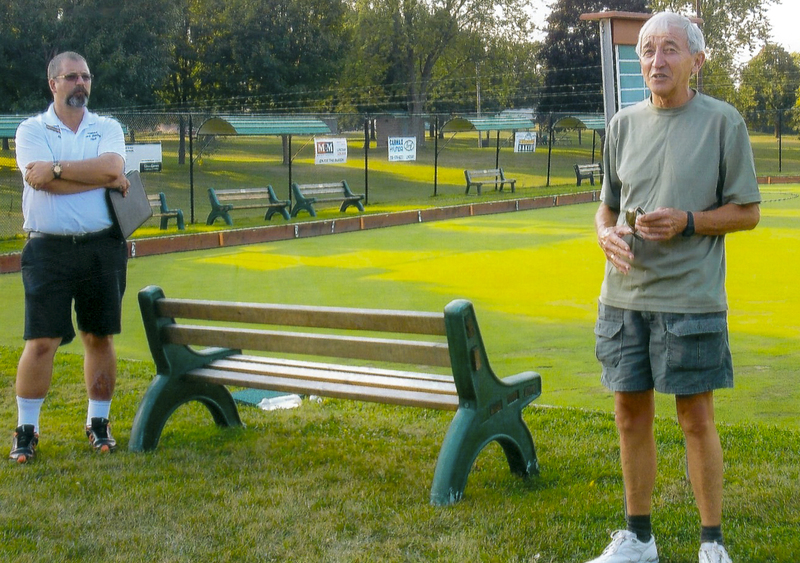 Joe Moher was two when the Lindsay Community Lawn Bowling Club opened its doors in 1922. The club, which has been a member of the Ontario Provincial Lawn Bowling Association since 1931, is still going strong. Initially, the club was located on Albert Street next to Central Senior School. 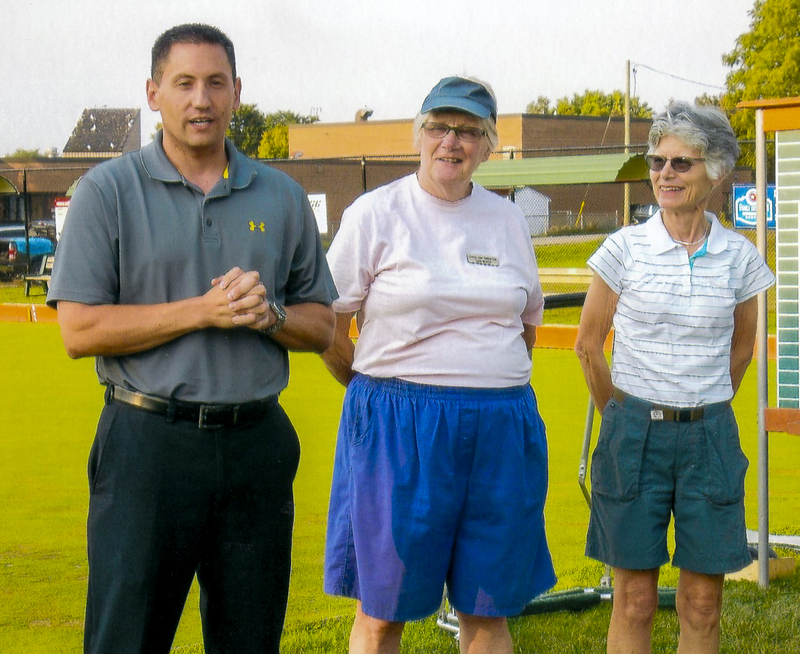 When plans to expand the playing field, install a running track and provide more parking spaces were announced, the club moved to its current location at Elgin Park. There have been several improvements made to the current club house and courts over the years. Most recently, a New Horizons grant was used to expand the club’s deck and purchase equipment. A $12,000 Lindsay CHEST Fund grant also helped with deck work. But it was at that first location where Mr. Moher was introduced to the sport. “I became involved when my daughter [Rosemarie] and wife [Mary] bought me a membership for Father’s Day,” he said. 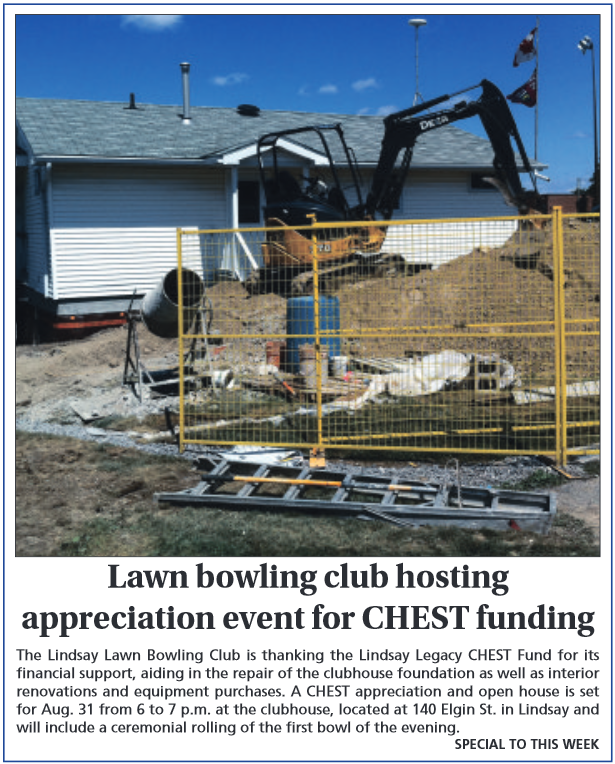 The neighbourhood ‘Avon lady,’ Lillian Brown, taught him how to lawn bowl, and, years later, made a sizeable donation to the club for kitchen upgrades. “I guess she knew we liked to eat,” quipped Mr. Moher. While he’s not as flexible as he was back in the day, and he prefers to bowl in the evening, Mr. Moher said the sport still holds the same attractive challenge. Lawn bowls is a sport played outdoors on a well-kept, level lawn area measuring 120 feet by 120 feet. The game involves a fair amount of walking, bending and stretching. The object of the game is to roll a biased ball – similar in size to an oversized softball – down the lawn attempting to get it close to a smaller white target ball. When playing a game of singles or pairs, each player bowls four balls, alternating with an opponent. The local club holds a variety of tournaments, but competitive opportunities can include provincial, Canadian and world championships, as well as Paralympic Games. The only contact in the sport is the hand shakes at the beginning and end of each game. 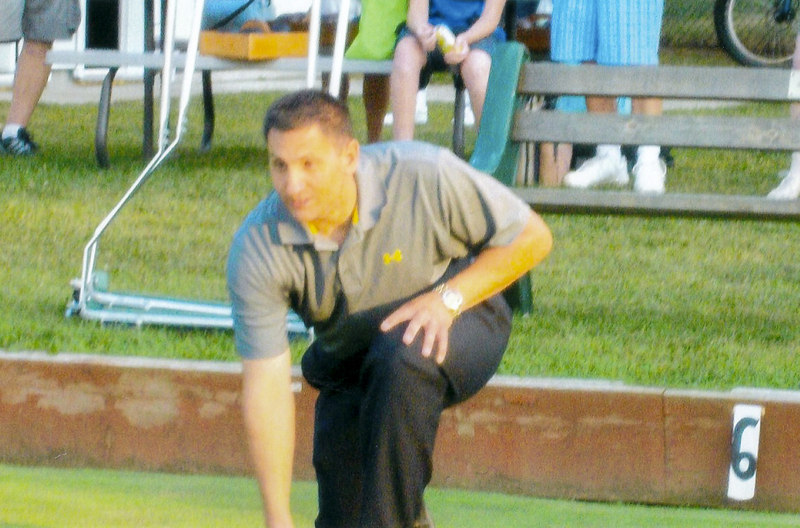 In addition to satisfying his competitive side, lawn bowling also helps Mr. Moher keep fit. “They say walking is the healthiest thing you can do. 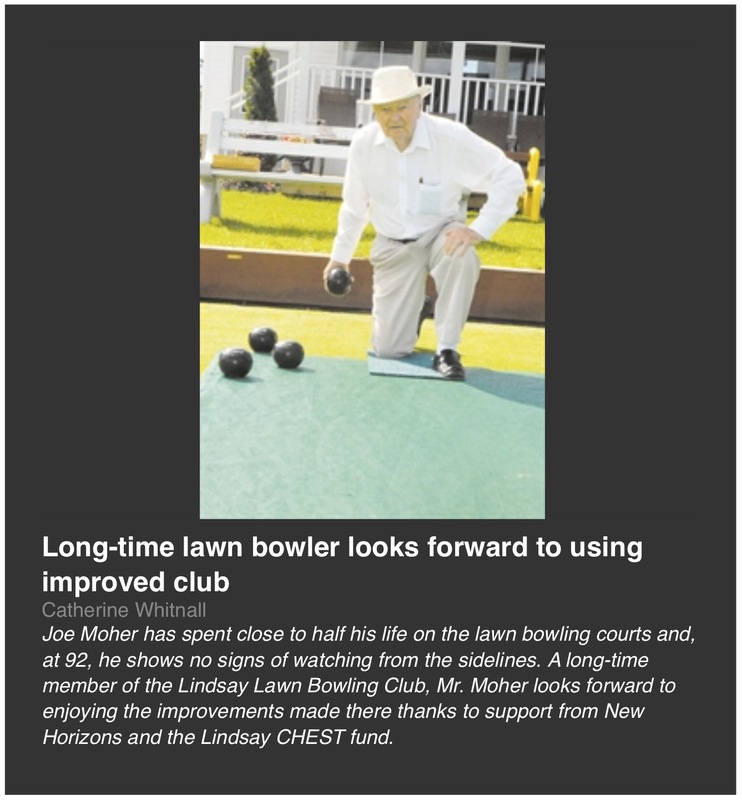 There’s a lot of walking in lawn bowling,” said the 92-year-young Lindsay resident who hits the courts about four times a week. 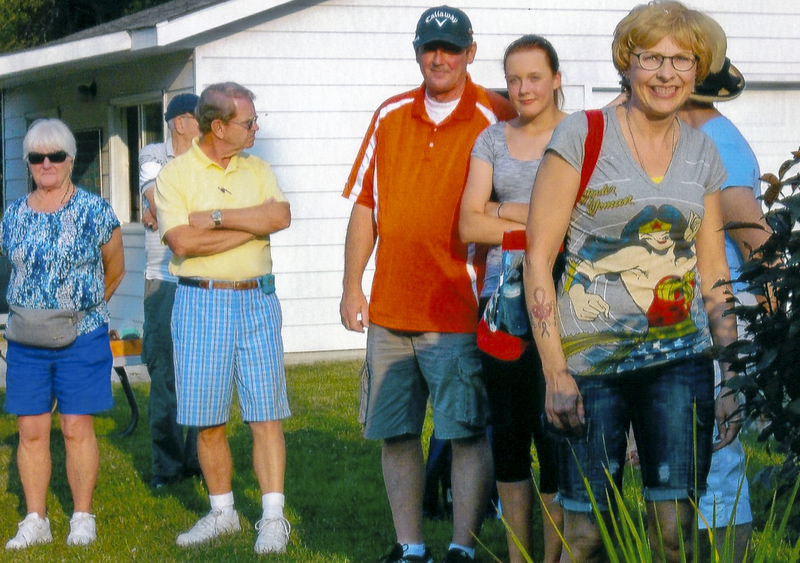 Lawn bowling also offers up a healthy dose of “fresh air and sunshine”, and especially fellowship and camaraderie. “As long as I can bowl with my friends; heaven can wait,” Mr. Moher said, flashing a bright smile. – The sport dates back to the 13th century. The world’s oldest surviving bowling green is the Southampton Old Bowling Green, which was first used in 1299. – Lawn bowling enjoys world-wide popularity with associations in the United Kingdom, Australia, New Zealand, South Africa, Hong Kong, the United States, Japan and Denmark. – The World Championships held in the UK annually is a Â£100,000 competition and is watched by three million viewers via BBC TV. – The Lindsay club hosts 10 invitational tournaments, for members of local clubs as well as those across the province. Numerous in-club tournaments and jitneys are also held each year. – Mary McKay, inducted into the Lindsay&District Sports Hall of Fame in 2007, went to National Championships three times: in pairs in 1976 and 1997 and as a single in 1988. She also won district fours in 1994, 1996, 2001 and 2004. – High school students have used the facility for physical education in the spring and fall. – In 2006, Lindsay hosted the District playdowns for novice trebles ladies’ and men’s teams. 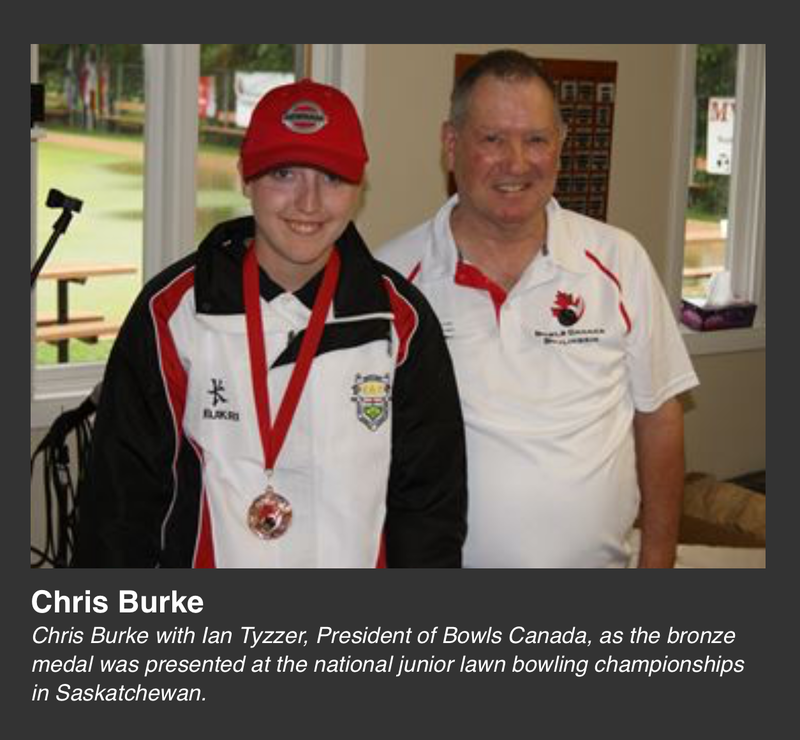 Chris Burke, 17, earned a bronze medal at the national championships over the August 4-5 weekend, as well as a spot on the national youth development squad. 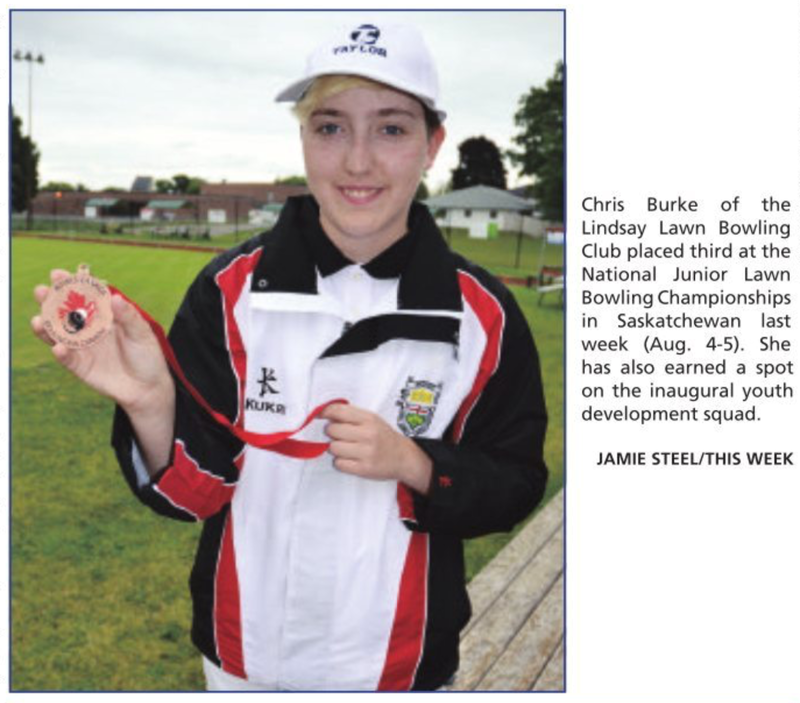 Chris Burke returned Sunday (Aug. 9) from the national junior championships with a bronze medal after winning four games at National Lawn Bowling in Saskatoon. While not every game went as well as she had hoped, Ms. Burke says it was a great experience and she’s thrilled to have participated. “It was a chance to see a part of Canada we’ve never seen before, to meet new people and have a lot of fun,” says the bronze-medal winner who placed first provincially in June, earning her spot at nationals. During the second game, which Ms. Burke admits “wasn’t close at all,” there was a dent in the green that added a challenge to the bowl. Her opponent, a Saskatchewan bowler who went on to win gold, managed to circumvent the obstacle and played a strong game, beating Ms. Burke 21-1. Even with the two losses (Ms. Burke fell to Nicole LeBlanc of Ontario 21-18 in round six) the Lindsay bowler says the event was a lot of fun. Ms. Burke says it feels good to improve on her sixth place finish at nationals in 2014 and she’s proud to have been one of Ontario’s three women bowlers (along with Ms. LeBlanc and Baylee van Steijn) to finish in the top four, nationally. “We all did our province proud and represented Ontario really well,” she says. Ms. Burke, who has been bowling for seven years, says she’s thankful for the financial and emotional support from the Lindsay Lawn Bowling Club. She’s looking forward to a few less competitive tournaments closer to home in the next few weeks, including the club championship in Lindsay on Aug. 22. Joining Jordan Kos of Saskatchewan, as well as Ms. LeBlanc and Ms. van Steijn, Ms. Burke earned a spot on the inaugural youth development squad, a program established to help athletes build their skills and develop for future international competition. While she doesn’t know exactly what opportunities being on the squad will present, she’s happy to have earned a spot. For more information about lawn bowling in Canada visit www.bowlscanada.com. 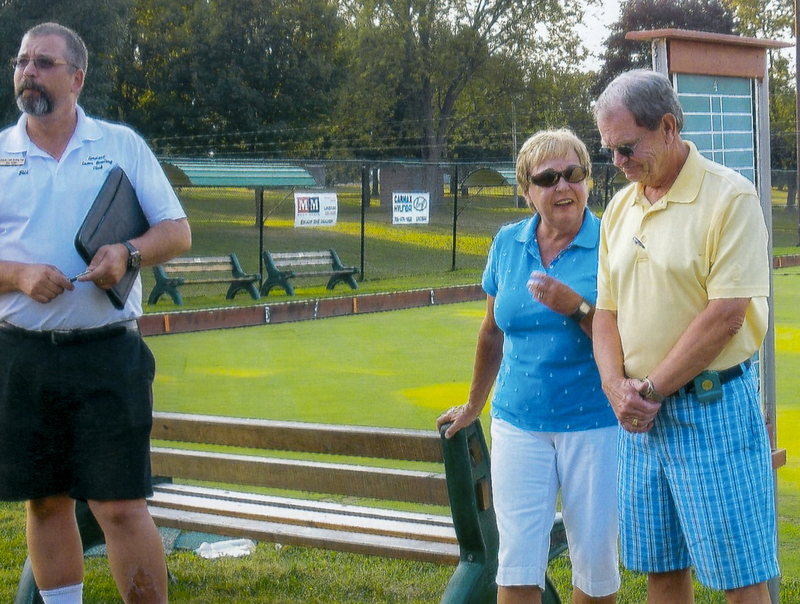 Information about the Ontario Lawn Bowling Association is available at www.olba.ca.